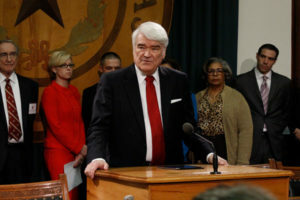 When a client needs to pass a bill in the Texas Legislature–or defeat one–they typically do two things: hire a lobbyist to work with elected officials inside the Capitol and enlist ECPR to handle media relations and build coalitions outside the Capitol. It’s a powerful one-two punch–with ECPR garnering editorial support throughout Texas, ensuring that grassroots support is maximized and creating superb printed materials and websites, lobbyists find that their jobs persuading legislators are far more effective. Among the tools we use to help clients with their legislative agendas are message development, media training, campaign plan development, the creation of strategic collateral materials, grassroots coalition building, digital media campaigns and statewide media campaigns that can include securing editorial board meetings and authoring impactful op-eds. At ECPR, we have worked on legislative issues ranging from transportation to education to healthcare. We have built comprehensive grassroots coalitions statewide and have executed numerous media campaigns that have played key roles in legislative success. No matter the issue, we know how to help shape discussions outside the Capitol to influence the votes inside the Capitol. When the Texas legal aid system faced a crisis in funding, ECPR provided comprehensive communications support to help garner the necessary legislative support to increase funding.